You will descend the Júcar´s Canyon, the famous canyon of "El Ventano del Diablo" in "Los Cortados del Júcar", a natural water park where you'll do canyoning by going down slides, jumps into pools, natural tubs and waterfalls, all in a unique natural area in Cuenca. 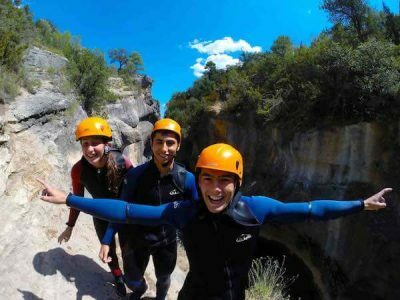 Canyoning in Cuenca is the most recommended activity of adventure tourism for those looking to release adrenaline and enjoy the nature in pure state. You have 100% guaranteed fun! Photos and Video FREE !! 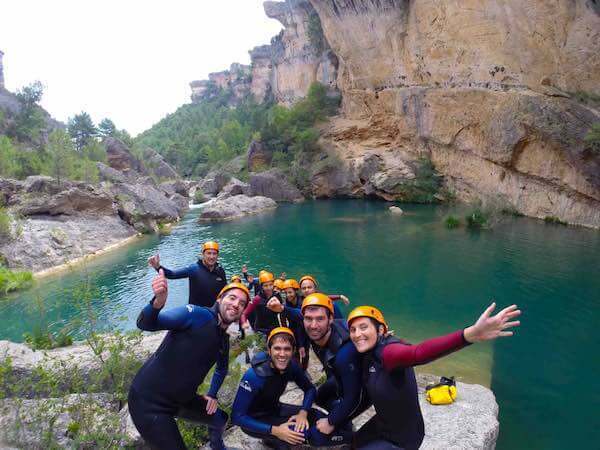 Difficulty Level: Suitable for all levels, canyoning basin does not need previous experience. All parts of the route are optional. Timetable: Morning (10h- 11h) and late (16h). Location: Barranco del Río Júcar, Ventano Canyon Diablo. Minimum group: No minimum group is required to make canyoning. It includes: Seland Neoprene (5 mm), helmet, qualified guides, insurance (accident and rescue), photo reportage and video montage for free. 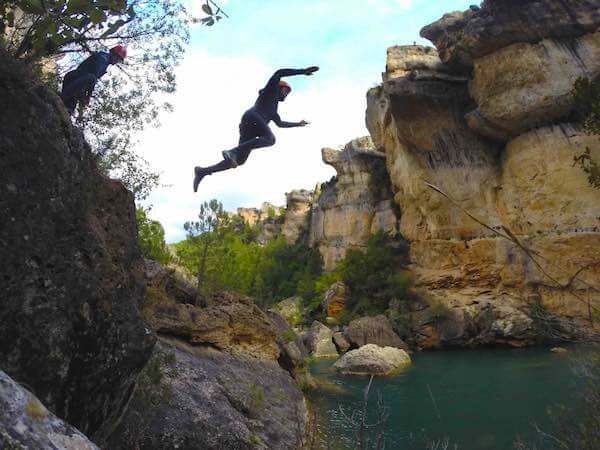 Is it mandatory to all parts of the Júcar canyon? 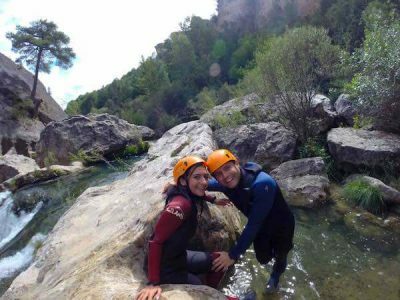 All parts of the Júcar canyoning route have alternative options, so you can enjoy all the activity of canyoning no matter if it's your first time. This activity is recommended for all levels. Can children do the activity? The little ones will be able to do the activity whenever they know how to swim, they have to measure more than 1 meter and have to exceed 25 kg of weight. 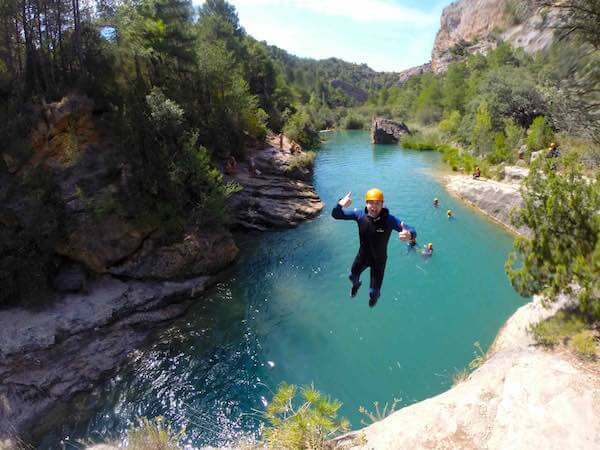 Is it safe to do Canyoning? It is a completely safe activity, all our guides are qualified experts with thousands of hours of experience and have the best equipment to ensure your safety while enjoying the canyoning in Cuenca. We have a complete security system and control systems including GPS, 4x4 vehicles, first aid kits, direct connection with health center and communications systems 24/7. When it rains, can the activity be done? 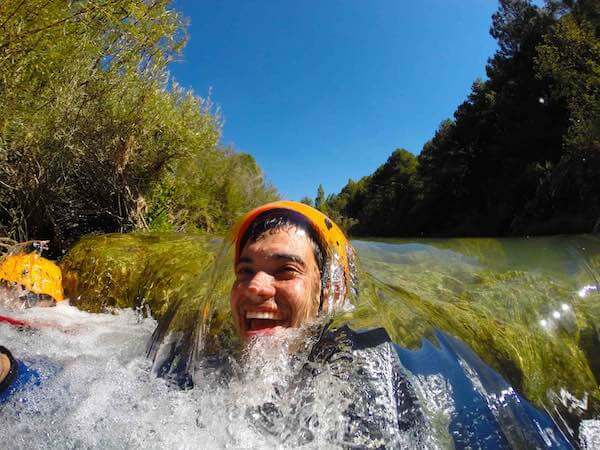 Canyoning can be done with rain, since it is an aquatic activity, only in case of thunderstorm will the activity be suspended. How many people will we be in the group? 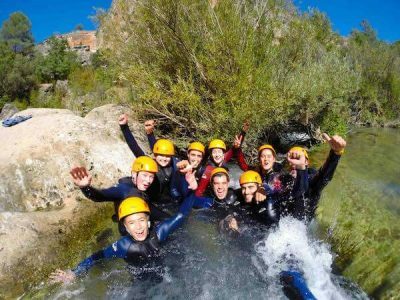 The groups for the activity of Canyoning are always a maximum of 12 participants per guide, so we guarantee maximum security and personalized attention. 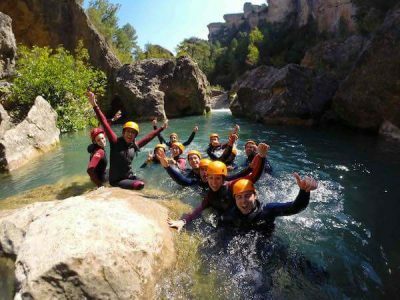 In case your group is bigger than 12 you will be accompanied by more guides, so you can enjoy the activity all together and will remain the maximum security in the development of the activity. Using lenses, Can I take them in the canyoning? It is recommended to wear diving goggles to wear contact lenses protected. It is a water ride, so we must avoid carrying objects that could damage or sink in water. Can I get my tourism car to the place of activity? Perfectly, these are places of easy access for all types of vehicle. 1. 100% Guaranteed fun. We guarantee that you'll have fun doing canyoning in Cuenca with us, we will refund your money if you're not having fun. 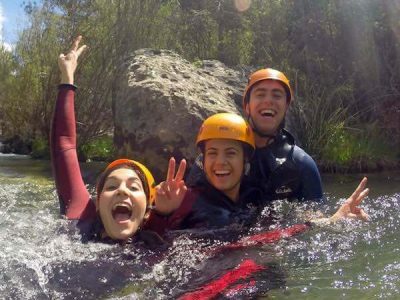 Canyoning is our specialty and it shows, because we spread our energy and desire in each of the activities. Our team offers a personalized service to each of the participants to meet their needs, to always ensure their safety and fun. 2. Maximum security. We are a registered company active tourism in Cuenca for all our activities, including always Accident Insurance, RC and Rescue. 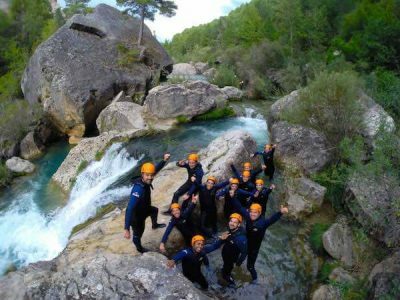 All our participants will enjoy the safest activity canyoning in Cuenca thanks to our exhaustive security system for all our participants. 3.Unforgettable memories. Apart from enjoying the best canyoning in Cuenca, you will receive a totally free photo and video reportage as you can see on our Facebook with more than +470 valorations with the highest score recognizing our great work. 4. Our facilities. 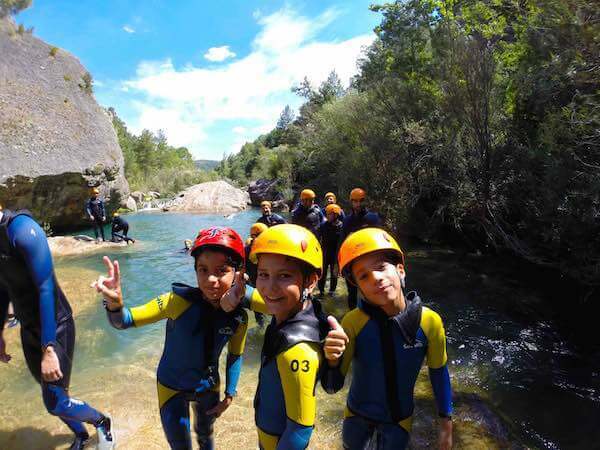 You will enjoy a full day of adventure in Cuenca, with free access to the municipal swimming pool of Villalba de la Sierra and its terrace restaurant in summer months. 5. Last generation materials. We have the advantage of having a wide range of materials for canyoning, so all participants will have the equipment in perfect condition and is its size. 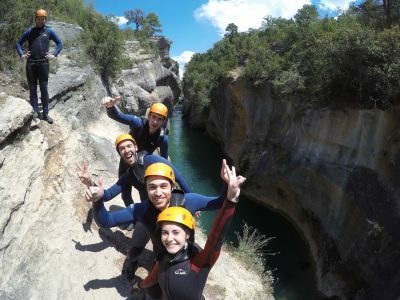 You will enjoy the best Cuenca adventure tourism. Canyoning in Cuenca is the most demanded activity, do not run out of space!